TopView Events for OPCA&E allows you to easily monitor, filter, report, and send notification (Email, SMS, TAP, Text-to-speech, Voice callout, …) for events generated from one or more OPC Alarms and Events Servers. OPC A&E is a standard that allows alarm and event generators to report the details of their events to clients. An OPC A&E client (TopView) can subscribe to the events without knowledge of the specifics of the underlying alarm generator. 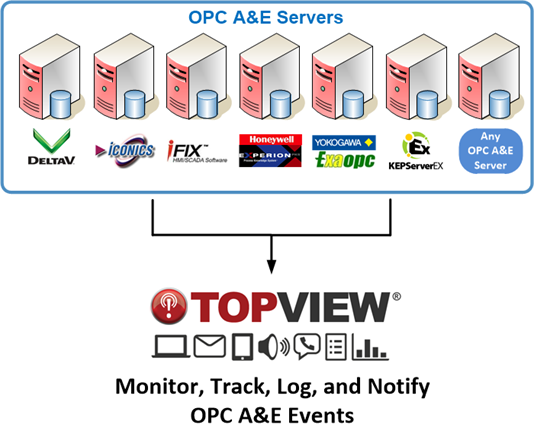 TopView OPCA&E allows the user to monitor, track, historize, and notify events from any OPC A&E Server including . You can download and test TopView Events for OPC A&E.